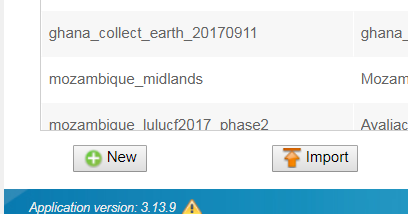 When you create a new survey in Collect you have the change to start with a Collect Earth or a Collect Earth + IPCC template. You should use it. We will also start creating a repository of surveys as this is a common request. The problem is, that when I import the examples into OF Collect, they appear as OF Collect surveys, not as Collect Earth Project (CEP). Hence export is only possible as Collect Mobile/Desktop File. Sorry, but I downloaded all examples (CEP) to my desktop. The only example that imports correctly (as OF Collect Earth) survey is ForestChangeAccuracyAssessment.cep. ALL others are imported as *.collect files. Where could be the problem? If you click on the New button in the survey designer you have the option to choose a Collect Earth+IPCC template, can you try that? It is a good starting point to design your own survey.